Difference between revisions of "JFaceSnippets"
Demonstrates creation of ToolTips for users pre 3.3. JFace-Snippets are small easy understandable programming example how to use JFace API. To browse the examples, navigate to theexamples GIT repository. Demonstrates first use case for the new OwnerDraw-Support added to JFace in 3.3 (available at SWT-Level since 3.2). This example uses the new Viewers API in this special case the OwnerDrawLabelProvider to make items with more than one line of text. 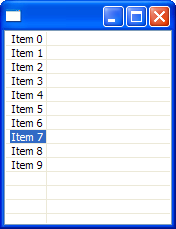 Demonstrates how you can use a use inline editing in tables with multiple columns which requires to use SWT.FULL_SELECTION but hiding the selection from the user. Demonstrates usage of new OwnerDraw-Support feature provided by JFace in 3.3(available in SWT since 3.2). This example uses the new Viewers API in this special case the OwnerDrawLabelProvider. Demonstrates how to refresh and viewer without scrolling the selection into after the refresh with 3.2 API. In 3.3 a special refresh-API for TableViewers is added. Demonstrates usage of JFace-Viewers in virtual mode with an ordinary content provider (often the bottel neck is not the model but the UI). Using this Virtual viewers in conjunction with an ordinary content provider has the advantage that Sorting and Filtering is supported in 3.3. Demonstrates how to achieve alternating row-colors with TableViewer and the new JFace 3.3 API which allows for faster algorithms and can be used in conjunction with virtual-bits to even work with big tables (e.g. 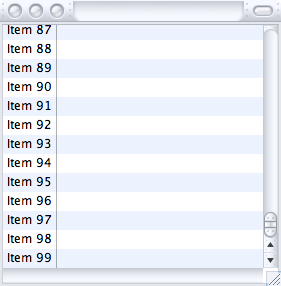 100,000 rows in this example). Because ColumnViewerToolTipSupport forces one to use the new 3.3 CellLabelProvider-API it is of no use for people stuck with the old LabelProvider API. This snippet shows how a potential class for 3.2 API could look like. 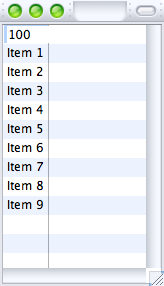 Demonstrates the JFace 3.3 keyboard editing support for Trees without columns. Tabbing from editor to editor is supported since 3.4. 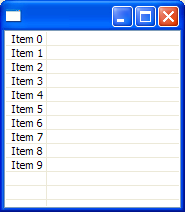 Demonstrates the JFace 3.3 keyboard editing support for Tables without columns. Tabbing from editor to editor is supported since 3.4. 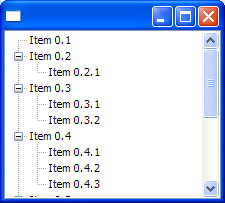 Demonstrates how to overcome a limitation when it comes to key-navigation and CheckBoxEditors in 3.3.1. 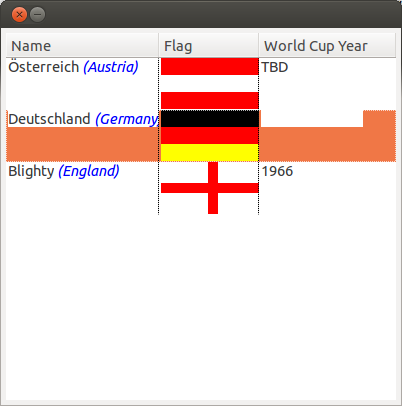 Demonstrates a new LabelProvider-Type which uses StyleRanges. This Snippet requires SWT/JFace 3.4. Demonstrates how you can add styled text by wrapping an existing label provider. This Snippet requires SWT/JFace 3.4. Demonstrate how to center an image using owner draw. This snippet requires SWT/JFace 3.3. 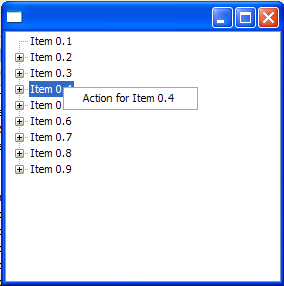 Demonstrate how to start up an editor with a context menu and not with mouse clicking on the cell. 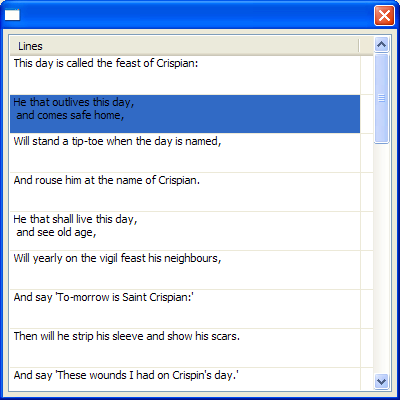 Demonstrates usage of TextAndDialogCellEditor. 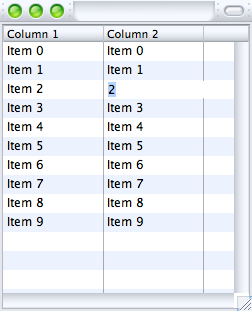 The email column uses the TextAndDialogCellEditor; othe columns use ordinary TextCellEditor.